Digitized Schematic Solutions (DSS) LLC is a certified Native American Owned, Small Disadvantaged Business (SDB) who specializes in the development of a custom-designed software technology known as the Digital Schematic Tool (DST) which introduces intelligence to Original Equipment Manufacturers (OEM) electrical, hydraulic, pneumatic and fluid flow schematics and drawings and which significantly enhances both maintenance and training disciplines. 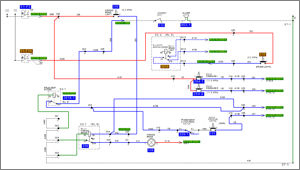 The DST includes two modes: Trace and Sim which when integrated simplify and educate the use of complicated electrical, hydraulic, pneumatic or fluid flow schematics information and the electro-mechanical interfacing of these complex systems. DSS also designs and develops Computer Based Interactive Training (CBIT) and Interactive Multimedia Instruction (IMI) modules that significantly reduce the novice student’s learning curve by enhancing both comprehension and retention factors while simultaneously supporting the continuing education of the more experienced student. DSS’ developmental techniques ensure continuity of traditional classroom-style instruction, on-the-job training (OJT), or refresher training for any program structure or methodology. DSS also provides on-site training support for all DSS developed software applications upon request. XMCO INC. is an 8(a) certified Alaskan Native Owned Small Disadvantaged Business (SDB) that, for the past 30 years, has provided a wide range of government and commercial clients, professional services in system supportability, technical documentation development, training course material development, provisioning support, program management support, proposal preparation assistance, and strategic planning support. Located in the greater Detroit, Michigan area, XMCO is strategically located to execute programs tailored to the varied requirements of the defense or commercial materiel acquisition process. XMCO’s professional staff is highly experienced in all facets of logistics to include system supportability and maintainability, TM/ETM/ IETM/IETP development, training design and development, provisioning support, program management support, proposal preparation assistance, and strategic planning support. For nearly three decades, XMCO has been directly involved in the DoD systems acquisition and engineering business, Integrated Logistic Support (ILS), MANPRINT, and program management processes through support contracts to both government and industrial clients. This experience includes support at all levels of the DoD, not only through contracts, but also through the related government service experience of our personnel. VDL-5 Technologies, Inc. is a veteran-owned small business that offers services in the field of Integrated Logistics Support (ILS) creating and managing maintenance-related technical content. Their team has broad experience with the ILS life cycle development processes, from research, logic and authoring to content verification and updating of data due to equipment changes. VDL-5’s experience includes the development of technical content for operator and maintenance manuals, parts data, system documentation, schematics software, instructor-led and computer-based training, integration of all these components into one deliverable package, and inclusion of Engineering Change Proposals (ECP) into existing government technical documentation. DSS has an in-depth and comprehensive internal Quality Assurance (QA) program to support all developmental aspects. This established QA program is the primary guidance for the entire DSS Seaport-e team on any task order received. In addition to day-to-day QA activities DSS utilizes a third party (Consultant) QA expert to thoroughly check every aspect of the deliverable product and ensure that a quality product is delivered. Periodic In-Progress Reviews (IPRs) and joint government verification/validation also ensures Statement of Work (SOW) compliance and on-going customer satisfaction…. these actions are routinely a defined part of the SOW. QA is further supported by our warranty program which ensures total compliance with directives for a twelve (12) month period following government acceptance and delivery.